For those of you who have been locked in a bomb shelter for the past few years we offer this introduction. 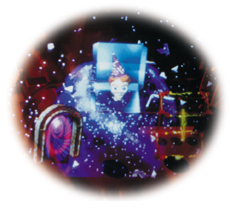 In January 1999, Williams first showed it's new pinball incarnation at the ATEI show in London England. It was dubbed Pinball 2000 and the premier game called Revenge From Mars. Pat Lawlor, along with George Gomez, developed the concept, and George lead the design team creating the sequel to Williams' popular Attack From Mars. Although this first effort was revolutionary in many ways, it was well known that an evolutionary process from game to game was needed for the form to mature. (check out the story of Revenge From Mars in PGJ #62, February, 1999). Next came John Popadiuk and his Star Wars: Episode One. This second game built on the first as it advanced the use of video graphics and interactive action to a new level. (See the story of that effort in PGJ #68/69, November/December, 1999). Then came number three. Pat Lawlor, Williams' senior designer and co-creator of the Pin 2000 concept, was given the task of moving forward, keeping what was good and answering the concerns some customers had about the previous two games. It was an exciting time for pinball but there was an undercurrent of danger. 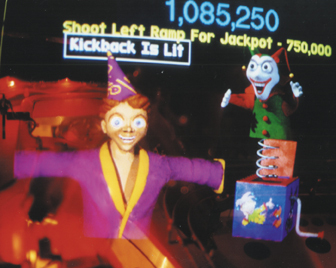 Was Pinball 2000 living up to the expectations of the people with the control? Not the players, not the operators, not the designers. The control was with the "top brass" who were looking at the bottom line. Then came Pinball Expo 99 and the scheduled speech from George Gomez about Pinball 2000. The lecture hall was literally filled to the brim, with many forced to listen from the hallway. George gave a very emotional speech that had everyone there, hobbyist and industry person alike, riveted to each word. Nothing was final. Things were shaky but ok. Pat Lawlor's third game would keep it all going. But two days later, that very next Monday morning, Williams Pinball Division employees came to work to find that their pinball was done. Stopped dead. As of October 25, 1999, Williams Pinball was no more. What of the Lawlor game? It stopped also. Unfinished, barely playable, this not-yet-a-game sat in storage for the past 20 months. There have been little or no details of this game released ... until now. Gene Cunningham of Bloomington, Illinois recently acquired the one working whitewood along with four additional playfields in various stages of completion. He kindly invited the PinGame Journal to photograph it and some surviving art for presentation here. The following is an interview recently conducted with Pat Lawlor about this game. 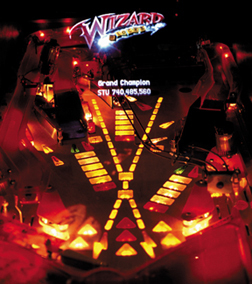 Pat, along with his "Williams" design team, is currently working on a new game for Stern pinball, but took time out to discuss the idea behind Wizard Blocks, to make some points clear and correct some possible misconceptions people may have about this ill-fated pinball. "The basic concept of the game was one where the game play mechanics had you knocking down a little brick or block wall. There had been many video games where that happened. My feeling was that since we were trying to integrate a video into a pinball machine, we'd try to integrate a game mechanic that everybody understood right away. They'd walk up to it and they'd just want to break up parts of the wall. Then I evolved the story line where there were things hidden in the blocks. There was an evil kind of wizard guy who put the stuff in them and it was your job to get it out. "Some of the blocks just gave you points, some of the blocks had an extra ball, and some of the blocks were actually spell outs. You'd hit different things like B-A-L-L on the blocks if there were four across, and you'd get an extra ball. The idea was that occasionally there was this thing that would drop down called a Wizard Block. The deal was that this evil wizard had put other wizards in these blocks and so when they were freed they appeared on the left side of the game, in that area by the jet bumpers. "At that point the wizard conjured up a challenge for the player to meet. There were five different kinds of wizards and five different challenges. You saw the jack-in-the-box ... that was from the little kid wizard. He conjured up his own challenge based on what he was ... the kid wizard conjures up an evil jack-in-the-box. It was then up to the player to attempt to defeat the challenge. In the case of the jack-in-the-box, you pounded on him and he exploded. However, that sequence was never completed. It's not done correctly. The jack-in-the-box was to have the ability to do many things; he was to have the ability to fight back. So there were parts of the game that were very unique in that the characters were allowed to attack you. They could do things like actually shoot missiles and then they were able to rebuild themselves. "That was what you saw, but the game was just a whitewood. It was a minimum of two months away from even going on test. Those internal whitewoods aren't even finished mechanically. There's stuff that isn't even on the game. The game is not complete. The software is not complete. That seems like an insignificant thing to some people, but the game is in such a rough state ... we had barely gotten to the point where we were able to play it ourselves! There were three people working non-stop on video and the stuff you were looking at was maybe 10% of what was gonna be in the game. We has scads of art that was yet to be digitized. "Not only is the game not done, but the software and artwork was never created. That stuff doesn't exist. The reason I'm saying all this is ... there seems to be some people who believe that if they could just get their hands on the computers that were at Williams, if they could just magically find some drawings of some kind, that they could complete the game. They can't. We were in the process of what we called 'cooking' the game. Most of the stuff never happened. It doesn't exist. There IS none of that. "The game was being developed and it was killed part way through it's development so what you saw was a tiny little snapshot in time. A time when we were still trying to figure out what was fun. Please tell this to all the people who read your article, in a very clear way, that there was so much yet to be added, much of it people were just thinking about!" While at Gene's we were shown the color separations for the playfield art. Pat explained that the only reason that part of the art was done was because of the time constraints they were under and had to complete the playfield first. The "seps" must be done by a minimum of six weeks before the playfield can be assembled. There was one feature on the game that was totally unexpected. It was a cool little detail Pat calls rotating domes. They are playfield light assemblies which feature one bulb surrounded by a spinning, slotted shadow box, inside a tinted plastic dome. Each fixture had it's own motor and when it spun it created a very neat flickering light effect. Pat explained that these were actually designed for use on Twilight Zone and they were never put on the game due to lack of money. "My background out of college is theatre. So a great deal of what you saw on the playfield of Wizard Blocks is using stage lighting to make sure that you could see the jet bumpers and still have a part of the playfield that you were playing the Pin 2000 concept on. There was a great deal of work done on that area in that game to answer some of the early complaints about George's game. But in all fairness to George, we were given no time to turn that into what it really needed to be. Pinball, the way we know it, has taken 50 years to evolve. Pin 2000 was given nine months to evolve into something and then it was killed. You can't do 50 years of evolution in nine months." Is there any future for Wizard Blocks or Pinball 2000? "That game (Wizard Blocks) is what it was when we got shut down. But that's all it's ever gonna be. It will never be completed. There is nobody currently who has the wherewithal to pick up and build Pin 2000. The amount of manpower it takes to do it is so astronomical. Here's an example: I now have a normal game team ... an old-time game team ... which means to me that I have a mechanical engineer, a couple of software people, an art ist, a sound and music guy, and a dot matrix artist. That's a core game team that works full time from between nine and twelve months to produce a pinball machine. You take all their salaries and you come up with some number and say this is what it costs me to develop that game. "A Pin 2000 project immediately doubles that number of people. It becomes a combination video game and pinball machine. It's like taking a Midway game team and coupling it with a pinball game team. You have an immediate increase in overhead and an immediate increase in the technological level it takes you to pull it off. There are people who bandy about this idea that you could somehow just buy the patents and build Pinball 2000. The amount of technical expertise is huge. "First of all ... you can't build Pin 2000 the way it exists because the electronics that were in the Williams version are no longer available. You couldn't even reproduce them. The board that ran that system was a consumer product that is no longer available. So you can't just take the bill of material and turn on the assembly line. You'd have to re-engineer the whole video portion of how that game works. Could it be done with enough money, sure ... but is a company willing to take all the manpower and the year and a half to start up and do it? My humble estimate of what it would cost you to pick up the project and try to run with it again is a minimum of two million dollars. That get's you the first game to the assembly line." Ok, but could you take the basic design of Wizard Blocks and build it as a mechanical game with some toy like a stack of blocks that go up and down like the file cabinet from X-Files? "The answer is 'yes.' But first you'd have to deal with the patents and ownership of the concepts. More importantly, ideas are easy. Everyone you walk up to has a great idea for something that should be in a pinball machine. It could be a theme or concept or whatever. "The hard part is building it and making it fun. People come up to me all the time at Pinball Expo and tell me they have a great idea for a pinball machine. And they are probably right. It is a good idea. But the hard part is building it. There's a great Larry DeMar quote about this. You are looking at a whitewood with no rules. Larry liked to say, "There's one great game in there, but ninety-nine bad ones." Almost two years later, how do you feel about Williams and the project? "The day they walked in and said, 'You're fired,' we moved on. They did what they did because they are a corporation and they do things for monetary reasons. The people in my part of the business love what they do because they get to create things. Any anger would be because we no longer get to do THAT kind of thing. Most everybody moved on happily and everybody did their own thing for their own reason. The one really unfortunate thing that I think Midway learned for itself, is that they took a whole lot of talented people and let them go, instead of finding places for them. It's unfortunate, in my mind, that they didn't find a way to do something with the assets. The company probably could have been sold and continued on. The answer to the question could Pinball 2000 have been made to work can be found in the latest issue of PlayMeter. Look at what game is number one ... it's a Pin 2000 product. And that's a year and a half after we closed. "However, the current economic reality of things is that ... in order for pinball to survive we must build very good games of the type we are capable of doing now. And so I would hope that everyone would be on that program. Gary (Stern) calls it mechanical action pinball. So for the game that survives, we've got to build the very, very best representation we can ... even with the constraints that come with it. Was Pinball 2000 a great experiment? It was a great experiment. Should it have been given more of a chance? You could argue that all day long. Do the people who worked on it think that it could have been a superior evolutionary product compared to what existed before? Sure, we wouldn't have done it if we didn't think that. Everything else is arguable on a bar stool. The only way to answer that is to find the person with the two million and try it again." What can you say about your new game for Stern? "Everyone is all excited because they think we're gonna deliver something like Twilight Zone. That's not the case. What we're working on is going to be a very good representation of what this kind of pinball is capable of being. But the limitations of the current pinball market are such that you can not go out and tool some ungodly devices, you cannot spend the kind of money we were spending in 1992 and 1993 to put things on a playfield. Just can't happen. "We can not sell enough games to make that possible. So what we have to do is take our best shot at what we are able to do and make it a very fun game and that's hopefully what we are doing. But for all these people who are claiming that what I'm working on is gonna be some ground-breaking tribute to pinball ... it's not gonna happen. Is what we're building gonna be a good game? Yes. Is it gonna be a smooth, fun game? Yes. Is it gonna have three Rudy heads? No. It's not, because in the current marketplace you can not afford to do that." Do you have any final thoughts about Wizard Blocks? "That game is what it is. That's how things played out. That's how the world is. That thing is a snapshot in time. A tiny little picture of what was going on at the time that Williams decided to close pinball. For that, it's a little piece of history. Were we trying to do something better? Of course we were trying to do something better. That's what we were paid to do. We're game designers.